During my career as a Group Vice President for International Paper, I was responsible for hundreds of events from small training sessions to large internal and external, multi-day meetings and conferences. The success of an event can hinge on the quality of the presenter. I understand the importance of finding the right speaker. Knowing that importance, I put this page together with you in mind. I hope it makes it easy for you to get the information you need to make the best possible decision. Thanks for your consideration. I am honored. I would be honored to speak at your meeting. When we work together, here is what you can expect from me and my team. Engagement with you and your team to fully understand the objectives and deliverables for your meeting. Prompt and professional attention to your inquiries from start to finish. A personal review and consultation with you (or your designate) to fully understand how I can best serve you and your audience. A professionally prepared presentation delivered with passion and energy that is focused on meeting and exceeding your event objectives. A custom resource page, created exclusively for you and your attendees that will allow easy access to the presentation content, references, links and key resources highlighted in the presentation that I believe will be helpful. A quick follow-up following the event. I want to know what I can do to further support you and solicit your feedback about how I could improve. I started speaking publicly over 40 years ago at my home church when I was in high school. When I was 25, I was teaching a class on achievement. At the time, I did not know that one of the attendees was an executive at Rockwell International. He would hire me to deliver my first corporate keynote to the team that was building the Space Shuttle. As I rose in my career at International Paper, where I ultimately became the Group Vice President of a $1BB business, I became a sought after keynote speaker for internal sales and leadership events. Outside of my professional career, I continued to speak at faith-based organizations—church leadership teams, youth groups, ministry groups and men’s conferences. In 2014, I shifted my focus and energy to coaching, speaking and writing full-time. I have written three books. 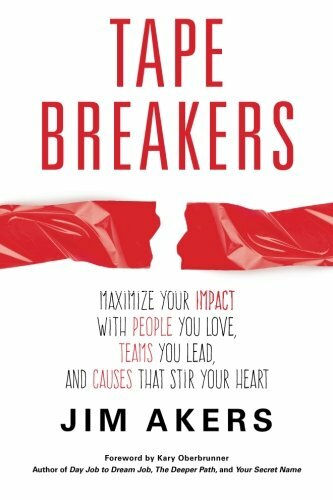 My newest one, Tape Breakers: Maximize Your Impact With People You Love, Teams You Lead and Causes That Stir Your Heart, was the “#1 New Release” on Amazon in March, 2016. My blog, the popularity and response to Tape Breakers, and the growing reach of ImpACTful Notes have attracted nearly 20,000 followers to this website (‘Like’ the Facebook Page). I met my wife Kristi at Washington State University and have been happily married for thirty-four years. We have two sons who are now rising in their careers in law and finance. We live in Southern California. In my free time, I enjoy golfing, reading and ministry. I am always relaxed and confident when I know I have someone of Jim’s caliber speaking. The MOO family is always in good hands when Jim delivers the message. The toughest audience is always the one who has seen you many times. Even more difficult when the group is primarily fully-commissioned sales professionals. To be able to inspire and motivate them requires unique talent—you’ve got it! Every time you are the highlight of the meeting. Jim presentations are always dynamic, relevant and inspiring. I’ve seen him present many times and he always delivers. Wow! I had heard about you for years. Your presentation was amazing. I only had to hear you once to know I would climb up a mountain behind you. You are that powerful of a leader. It must be a God thing—no one can have that much joy without God guiding their way.